My name is Nicolas Casella, and I was born in Cordoba, Argentina in 1977. In 2003 I moved to the island of Cozumel, Mexico to work in hospitality business. After two months living in the island, I did my open-water diving trainning, and immediately my outlook on life changed. A few months later, I started working as a videographer in a dive center in Playa del Carmen, where I met the world of the cenotes and caves, and was formed as an open water instructor and cave diver and lover of the natural wonders of the Yucatan Peninsula In 2007 I decided to start my own project, Cenotexperience, a boutique dive operation specializing in cavern and cave diving, which offers a personalized service based on the needs and requirements of each client. In addition to diving in the cenotes, I also offers scuba diving in the sea in Playa del Carmen and Cozumel, and recreational courses and technical level. 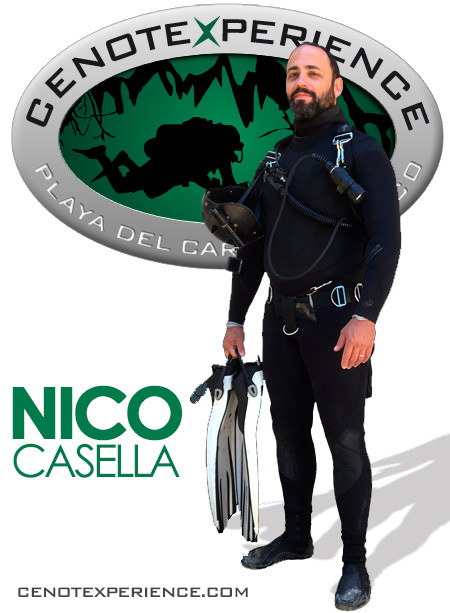 Over the years, I have done over 7000 dives in Mexico, Belize, Thailand and Indonesia, Red Sea and Florida, most of which are in the cave systems of Yucatan I speaks Spanish, English and French.